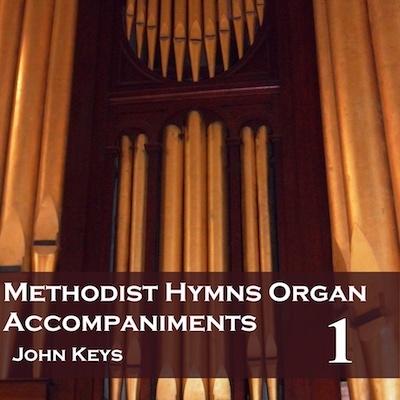 Our Core albums and many of our other albums are useful for many different denominations, but on these four CD or download albums we focus on hymns from the great Methodist tradition. See below for a list of tracks. There are no voices on these recordings, just a playover and the accompaniment. CDs 3 and 4 are recorded from the new Methodist hymn book, Singing the Faith. Because of that, there are a few overlaps with some of other recordings like the Core Set and the Ultimate Set, but featuring the specific harmonies used in this book. Any or all of the tracks for these albums can also be download from Amazon and iTunes, or the whole Methodist set can be downloaded directly from us. To download the whole set from us, use the Buy Now button here. For individual tracks or the whole album from Amazon/iTunes see the Hymns included section below. Please note the album cover shown is for our online album only. The CDs have a different cover.